I am not a trained cook; I grew up in a family of us all having to help in order for the day to be a success between school runs, swimming, sports and music commitments, and home-work. My brothers are skilled cooks also; there was no separation of tasks between boy and girl; everything was equal rights! So we all learnt to cook in the traditional old-fashioned Protestant way. “Real food” in other words and no fear of fats; until in later years when this was wrongfully drilled into our parents and Flora and Stork margarine then appeared on the scene. Foods back in the 80’s were more basic, food budgets tighter and the choice of vegetables and fruits more limited. We didn’t suffer for this; it just was what it was, more basic. We enjoyed meat, fish and poultry with vegetables and potatoes, stir-fries were a Saturday night bonding between my dad and I, mum made a spaghetti Bolognese to die for, pasta was rare, and we enjoyed some Irish curries 🙂 loaded with vegetables on rice on occasion. My vegetarian stint was most likely a major inconvenience to my mother but she rose to the food challenge and we probably all benefitted from new food ideas and a bit more variety. I now live in a busy house of two self-employed long-working hours persons. My boyfriend and I both train 6 to 7 days a week. We love food, we love home-cooking and we value and appreciate our bodies. You must nourish and fuel well to stay healthy, fit, and strong. It takes a continued and persistent effort to locate, buy and prepare good food and to not get caught out on busy days. As much as we love food, we don’t have time for fancy cooking and recipe book reviews so what gets prepped in this kitchen comes from the heart. Our busy lives mean that we often enjoy a slow cooked stew; they bring warmth, comfort, nourishment, and multiple health benefits. They also pack up well for lunch and freeze well for a busy day’s meal. 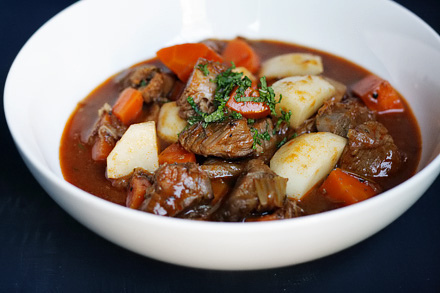 Stews are also a light and easily digestible meal and a super choice for weight management. 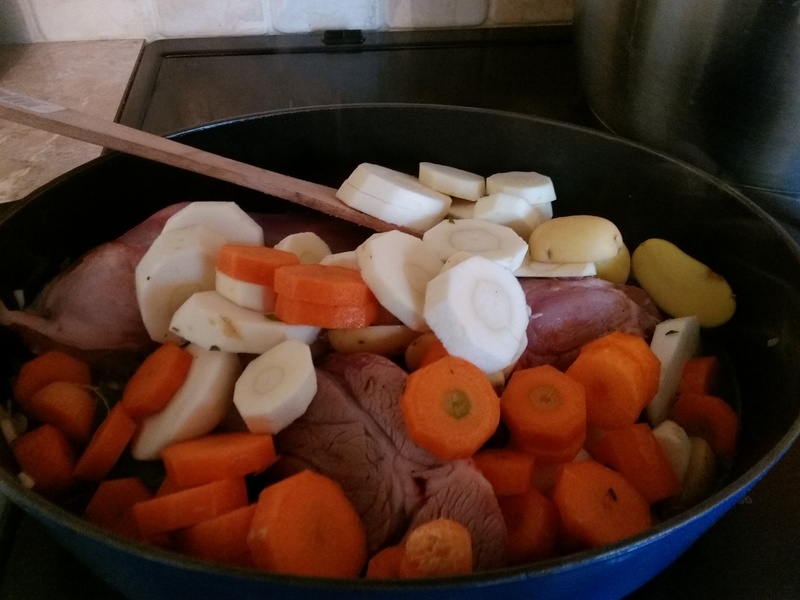 I am going to detail a few of the recent recipes in our house to hopefully inspire you to see that making a nice stew is quite easy and can be a very economical option. The vegetables selected aren’t for specific reasons other than they are what I had available to me in our fridge. I have been experimenting with different cuts of meat. Cuts of meat that any good butcher should have and they aren’t pricey. If the quality of the meat is good please don’t be fearful of the fats; they often contain omega 3 from the wonderful grass that our Irish animals thrive on; and the jelly type consistency that these stews cool down into is a sure sign that the broth is jam-packed with soft tissue and ligament supporting nutrients (e.g. collagen). These nutrients are beneficial for anyone interested in maintaining healthy skin, hair, nails, ligaments and tendons. This nourishing broth is also superb for supporting a healthy gut. Meat: we choose local and Irish good quality meats but not necessarily the pricey cuts. 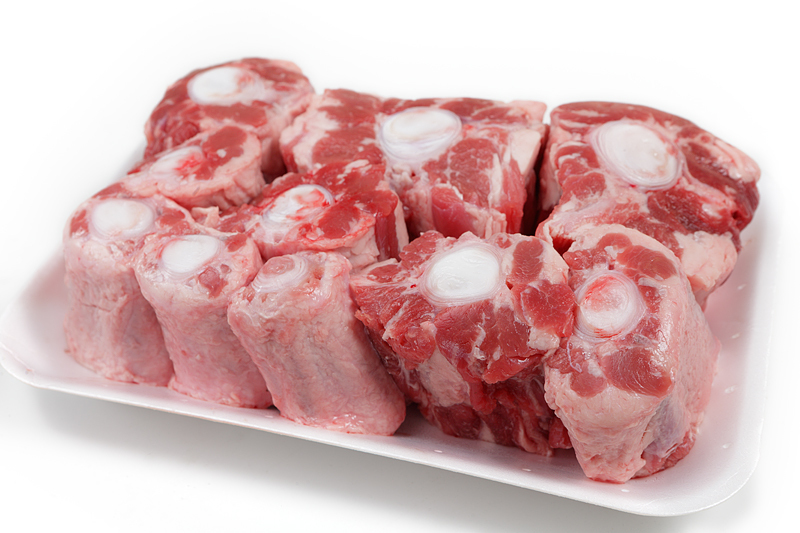 We have used beef rib, lamb shanks, stewing beef on the bone, oxtail, lamb cutlets on the bone. I aim to buy meat on the bone to benefit from the bone nutrients and the immune supporting bone marrow. It is quite a minefield getting used to all the different cuts of lamb and especially beef; when in doubt ask the butcher what is good (FYI I didn’t eat any meat aged 14 to 24 so I always feel a little behind in my meat cooking skills I highly recommend dating a South African for these reasons they know their meat!!). Vegetables: I usually start with onions and garlic; depending on what end flavour I am going for I may add inflammation reducing ginger and fresh chili. Then anything is a go. 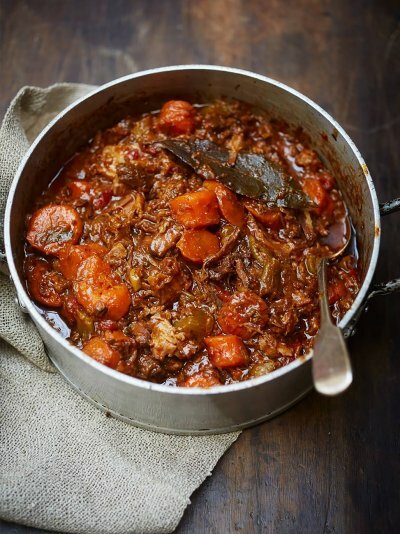 As stews are a winter food, available seasonal options include carrots, parsnips, aubergine, swede/ turnip, squash, celery, celeriac, sweet or Irish potatoes, mushrooms, etc. If I can I will always add something green for example the following may be added towards the end of stewing: courgette, green beans, Swiss chard, broccoli, cabbage, kale or spinach. Tomato based stews may include fresh tomatoes, canned tomatoes, tomato paste and perhaps some red wine or balsamic vinegar for depth of flavour. Red peppers also add a nice twist. I usually add a dash of sugar to improve flavour. Water: use only filtered water as tap water is full of chemicals and you don’t want a chemical loaded stew. Stock cubes aren’t necessary as the meat will create a rich flavoursome broth. Herbs: I don’t cook with set rules; I have added a tweak of Thai curry to my beef rib stew, and the usual go to herb is thyme, salt and pepper as this rocks a lamb stew; Moroccan spices and mild curry spices may work well also. I go light on the herbs and let the meat and vegetable flavours do the talking. Salt and pepper are best added early on in the cooking process to bring out the meat and vegetable flavours and enrich your broth. Sautéing oil: I normally use extra virgin olive oil for sautéing the vegetables and braising the meats; coconut oil may be preferential when using more Asian themed spices. Butter is ok but has a tendency to burn. Sunflower oil is not recommended for health reasons. Time: patience and time are the secret ingredients for a tasty stew. The longer you can let the meat gently simmer on a very low heat on the hob or in the oven at a low temperature then the more tender your meat and the more flavoursome your stew. I tend to let my stews cook for at least 1 ½ to 2 hours on a very low simmer and let them sit for even longer before eating. Utensils: we have a large Le Creuset pot that gets a lot of use, or for the more water-filled light broths I will use a very large soup saucepan. A slow cooker or Le Creuset pot will allow for you to leave the house and set the oven timer to cease cooking when your time is up; cooking on the hob requires you to be at home in some sort of supervision capacity. On occasion the broth can get just a little too fatty; if so then use a fat strainer to remove the surface layer. This is a super neat little gadget. Some fat does us no harm; however fattier cuts of meat can release a lot and so the removal of some does no harm to keep the calorie content of the meal in check. 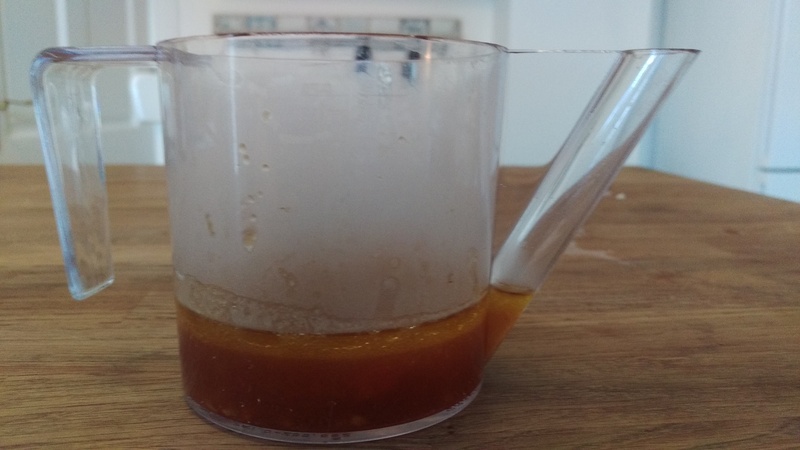 If you don’t have a fat strainer the fat can be easily skimmed off when the broth cools completely as it will solidify on the top. Wash, peel and prepare all vegetables. If using the oven pre-heat to 150-160 C.
Sauté your onions, garlic, and chili or ginger if using in a dash of oil. Add your dried spices or herbs. Add your filtered water; the volume depends on how thick or light your desired stew will be. Add more water for a light broth; add less for a thicker more dense stew. Water can always be added later if you need more. If making a Tomato based stew now is when you add your tomatoes, tomato paste or canned tomatoes and red wine/ balsamic vinegar. You may not need to add much water to keep the consistency rich. Add your slow cooking vegetables. Bring up to a simmer and then leave to simmer, covered with a lid on the hob on a very low heat or place covered in the oven at 150-160 C. Keep an eye that the temperature does not rise too much; this should be barely simmering. Your total cooking time may vary; I tend to shoot for a total cooking time of at least 1 ½ hours to 2 hours and preferably longer for a more tender meat. Approx. 30-40 minutes from end of stewing time add your fresh herbs and quicker cooking vegetables such as leafy greens and fresh herbs if using. Keep on a low simmer until ready to serve. Or leave covered off the heat if consuming later. Serve on your cooked grains, polenta or mashed potato etc. of choice. Stews will last several days if stored correctly in the fridge in sealed containers. Portions freeze well and also travel well to work for lunch. These broths really are a meal in themselves; however hard training athletes and hungry growing children, or manually active working persons may like to add some more nourishment. Mashed potato, mashed sweet potato or celeriac, polenta, rice, quinoa, couscous, and cooked buckwheat or millet grains will act as a nice absorbent base to this stew. I don’t know why it works but some pesto and as a treat cheese often tops these stews off well. The stew recipes below are very light; because I like to keep them light; using less water will create a denser richer stew. Here are four recent recipe successes; ingredient quantities are a rough guide as to be honest anything goes with these easy stews. So don’t feel obliged to stick to the listed ingredients as the recipe is highly adaptable. Notes: I added all the vegetables in at the start (after sautéing the onions, garlic and ginger and braising the meat) and let this simmer for at least 2 hours (it rested for a few hours before eating so the meat was very tender and falling off the bone). The stew was made on the oven hob in a large pot. I made a light broth using a generous amount of water with a bare hint of the spices. We served this on polenta that was started in the pan and then baked in the oven in a sealed le Creuset pot (very convenient as polenta requires a lot of stirring when prepared in a saucepan to prevent it sticking or burning). My photos aren’t great as we spent more time enjoying this than me recording the process. Notes: I oven baked my tomatoes and red peppers first and then added these to the sautéed onions and garlic and stewing meat. Looking at my photos I also decided to oven roast the tomatoes also. So it was only the garlic and red pepper that I sautéed before braising the meat and then adding all the remaining ingredients. I simmered this dish on the hob with added canned tomatoes, tomato concentrate, balsamic vinegar, freshly chopped oregano, dried mixed herbs, sea salt, pepper and sugar to taste. I cooked this until the meat was tender and the tomato broth rich (approx. 1 ½ to 2 hours). I didn’t add much water to this; I cannot remember to be honest so use your judgement on whether additional water is needed. You could if you like add red wine instead of balsamic vinegar for a twist and depth of flavour. Serving suggestions include mashed potato, mashed celeriac or sweet potato, rice, quinoa or polenta. Typically the photos ran out as the taste and hunger got the better of me! I actually added a lot of the juices from the roasted tomatoes after skimming the fats off using the straining jug. This dish really rocked. The meat was slightly on the tough side so I may choose a different cut or simmer it on a lower heat for longer the next time. This was the first time that I had used oxtail I stuck to a more traditional light Irish stew type approach allowing the meat make the flavours and take the leading role. My vegetable selection available to me was a little limited so I used aubergine to fill the space. From memory I may have added some broccoli towards the end. Notes: I cannot fully recall all the ingredients used and this should document to you that in truth once you have a good cut of meat then anything goes!!! We served this on pan-started and oven-finished polenta mixed with thyme and grated potato (all in together and then cooked). G may have sneaked in some cheese before serving. Hope this inspires you to get creative in the kitchen! This entry was posted in Recipes - Healing and nourishing foods and tagged athlete food, casserole, stew by Andreacullen. Bookmark the permalink.